Another case of Federal Government helping out the politicians at State level based on their political affliction. The Federal Government will provide matching grant to Sarawak’s Barisan Nasional MPs and assemblymen on whatever financial aid they receive from the state government next year. Mawan, also state Social Development and Urbanisation Minister, said in his presidential speech earlier that due to the constraint of resources, the elected representatives’ performance might fall below par and reflect poorly on the Barisan government. “If lack of resources remains a problem and affects their performances, the elected representatives may be lured by temptations as abuse of power and corrupt practices to short track their course. “If they do succumb, they will be at the mercy of some unscrupulous powers,’’ added Mawan. He urged the Barisan supreme council to resolve the problem and work out “some kind of arrangements’’ to help the Sarawak elected representatives assemblymen to better serve their constituents. ARE federal earnings funded by taxpayers in Pakatan Rakyat (PR) states returning to benefit the public in those states? What’s clear in the case of Selangor is that funds are used for development but are not channelled through the state government. That has become clear in Penang as well, where promised funds for Georgetown’s heritage status have not been delivered to the PR-governed state. The Barisan Nasional-led (BN) federal government should stop funding all parliamentary and state constituencies controlled by Pakatan Rakyat (PR), Umno Selangor information chief Abdul Shukur Idrus told the party’s delegates today. “(The government should) give only to those areas in which we (BN) won so people can differentiate how the BN works compared to the opposition,” Abdul Shukur said during debates of Umno President Datuk Seri Najib Razak’s policy speech. Of course, when one is talking about the way the BN led Federal Government treats the States ruled by Pakatan Rakyat in the past, we only need to see the State of Kelantan where agreed oil royalty has been held back and channelled to entities which are not related to the State Government. 1. Who the Federal Government is really representing? Does the Federal Government represents all people under the Federation (regardless of their political affiliation) or the whims and fancy of certain political parties? A federation is a type of sovereign state characterized by a union of partially self-governing states or regions united by a central (federal) government. In a federation, the self-governing status of the component states is typically constitutionally entrenched and may not be altered by a unilateral decision of the central government. 2. If the Federal Government suppose to represent the people under the Federation, then why the abuse of taxpayers’ money for only Barisan Nasional MPs and assemblymen? The money to the Federal Government comes from people in forms of taxes, commissions and charges and that includes people in the constituents under the opposition party? So, why the distinction when it comes to the disbursement of the said money to Pakatan Rakyat controlled States? 3. As “the lack of resources” is deemed as something that will “adversely affected their effectiveness in serving their constituents”, by denying the same to opposition MPs, is the Federal Government sabotaging the people who have elected oppositions? Using the same analogy, lack of funding for opposition MPs will also adversely affect their performance. Every elected politician is entitled to some kind of grant and allowances for them to perform their duties. What makes a BN politician to be more eligible for more money compared to a PR politician when the end users are going to be the people? If so, do the people in these constituents (held by PR politicians) have the right to hold back their taxes and channel it back to their local MP or State Government? 4. Then do we really need a Federal Government? Having a Federal entity which unites the various the administration aspect of the States is necessary and therefore it is critical for us to have a strong Federal Government. But the thing is this – there is a clear favouritism from the Federal Government who seems to be only working for the benefit of their own political party members and do not concern much on the state of the Federation as whole? If they are picking which of the states deserves more money and that the criterion is sorely based on the political affliction, rather than actual need of the people or development of the State, then do we really need a Federal Government who is bias and unfair? 5. Mawan said “the elected representatives may be lured by temptations as abuse of power and corrupt practices to short track their course”. What does this means? It is not a secret that corruption is high and remains much unresolved in Malaysia. Now with this little revelation from Mawan, is he trying to say that the MPs and assemblymen are just too corrupt that the Federal Government has to keep pumping in more money just to make them happy and be away from alternative sources (bribery or other illegal means)? Why can’t MPs and assemblymen have some sense of duty and sense of obligations to the people who have elected them? This way, despite the shortcomings in funding, they can still uphold a sense of integrity and avoid falling into the usual trap of corruption and bribery. In Malaysia, the role of Federal Government is quite wide and powerful, for they are handling external affairs, defence, internal security, justice, federal citizenship, finance, commerce, industry, communications and transportation. Does the Constitution mentions “State governed by Barisan Nasional and excludes States governed by Pakatan Rakyat”? It only mentions State. And what that means? It means that the Federal Government is supposed to work for all States and not just some States. 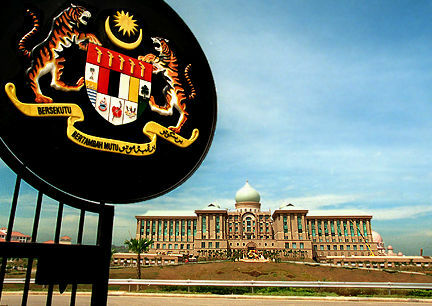 If Najib as the PM for Malaysia (and not PM for States controlled by BN) wants to portray a fairer style of governance and promote his 1Malaysia kind of branding to all Malaysians (with different political afflictions), then he should get his Federal Government to start acting as one who represents all States with equal treatment and fulfilling any agreed agreements. This should also includes scrapping any policies that call for bypassing the State Government and the Federal Government ending up playing the State Government’s role with duplication of work and waste of precious taxpayers money. Posted on 31 December 2009 31 December 2009 by B.JoePosted in Governance, Government, Malaysia, Malaysian Politicians, Malaysian PoliticsTagged 1Malaysia, Barisan Nasional, BN, Federal Government, Government, Pakatan Rakyat. Let me just give you an analogy; a practice in a state that I come from. In Singapore, the non-PAP held constituencies such as Potong Pasir and Hougang, the government treats them like ‘stepsons’ and they don’t even build MRT stations to serve those areas, amongst others. Potong Pasir’s MRT station was completed long ago but was not open for a long time citing ‘technical problems’. It’s only recently opened for use. If you drive in Singapore and notice potholes or not-so-beautifully decorated road shoulders and dividers, and fairly dark when driving at night, chances are, you are in an opposition MP area. Most of the MPs of the contituencies like these two, are relatively poor and many become poorer, after losing some defamation suits againsts LKY (who could ever win against him?). Some even became bankrupts, like the late Jayakumar, and by default, lose their seats. But, after a by-election, the opposition still wins. So, I guess, the treatment given to any opposition MPs and their constituencies, in the case of Malaysia, states like Kelantan, Kedah, Pulau Pinang and Selangor as you desribed in your blog above, is ‘normal’ and this same phenomena happens all over the world. Singapore pays their ministers, deputy ministers, all their lawmakers including MPs and NMPs, a hefty sum, sometime exceeding S$2 million annually in several cases plus other first-class perks. This policy is positively effective there. These people accept them happily and extremely rarely or almost none would ask for more. If this very same policy is placed and practised here; even if our lawmakers are paid twice as much as the Singaporeans plus twice the perks, I bet you it still won’t be enough. Many, if not all, will ask for more, and corruption will still not stop because our people have a very different lifestyle and has acquired a very much much higher taste. And also, because, corruption is a culture here. So, what I think will happen to the things you brought up in your blog will just remain an information or at best, an academic exercise and would benefit those people interested in the study of or research for information when taking up political science, sociology and anthropology or government at universities. Even if you bring them up to the highest authority here, they will simply be ignored. People like you and I and the others will keep on picking up excerpts or quotations from ministers and senior civil servants and make opinions, proposals and suggestions on this so-called ‘lopsided’ affairs, spread them and at the end of the day, nothing happens. Whatever it is, do continue with it and hope that one day, positive actions are taken for the sake of all the people in this country. hak55 – it is true that what I have posted here will remain as information because in the world of politics in Malaysia, no stop is made on all attempts to regain the “lost” seats and this includes cutting off critical funding to the PR led State Governments. I am pretty sure that it is the same case in many other 3rd world countries (even in Singapore as you have clearly illustrated). However I pretty sure once we have developed into a “developed country” (developed in mind and attitude as well) in par with US and many countries in Europe, such below the belt kind of tactics will give way to proper governance and rule of law. Of course, we have a long way to go before we can even be considered as developed country (like one said we have 1st class infrastructure but it means nothing if we still have 3rd class mentality). So how do we effect change? By continuing to disseminate information and incidents of unfairness. This is because in 10 – 20 years time (or it could be now), we are going to a whole new generation of Malaysians who are more exposed to information and know how and embraced ideal attitude. They may not be so accommodating to the things that our politicians do these days. I hope that with the right information at hand, they will effect change. I hope that they will form pressure group to their local MP or assemblyman to do the right thing. I hope that they will vote in a new government which will put the interest of the nation first. And more importantly I hope that they will teach the next generation on how to do things right and proper. As you have mentioned that one day positive actions are taken for the sake of the people in this country, I am hoping for the same. We may not be effecting change by rallying on the streets but we can do our part by writing about the unfairness and the ideal ways of doing things. Just hope that someone will pick up the cue and make it happen. We need a very strong leader who is committed to improve things for the nation, regardless whether he is a Malay, Indian, Chinese or others beside the suggestions that you and I have made. Even if the next generation of people ‘are Malaysians who are more exposed to information and know how and embraced ideal attitude. They may not be so accommodating to the things that our politicians do these days’, to quote you, that still will not be enough. We need a revolution, a non-violence one preferred, and with the said leader, things will definitely get better. History tells you that almost all nations in the world improved after a revolution, more often than not, after a bloodshed. There were of course, setbacks, and things got worse, like some African states today, but those are the countries we don’t want to be like. When will this improvement happen to our beloved country? Well, only God knows – next generation, generation after next or later, but as long as it comes, that will be fine. Sorry, it’s not Jayakumar (Prof.), it’s Jayaretnam. The former was Deputy Prime Minister and before that he was the Interior Minister. Sorry for the mistake, I always confuse these two names. The latest item in Singapore, the richest state in South East Asia, is that they will not be telecasting the World Cup live because of, yes, you guess it right, MONEY!